This landscape occupies the largest portion of the watershed between the Olifants and Letaba Rivers. It is high lying (between 350 and 450 metres) and the underlying material consists mainly of granite and gneiss. Isolated plugs of syenite from the Phalaborwa Ignious Complex have penetrated into the granite to form koppies of which Masorini, Shishwani, Shikumbu, Shivulani and Vodogwa are the most outstanding. The area is situated on the upper course of a few spruits that drain into the Letaba and Olifants Rivers. Most important of these are the Tshutsi, Mulalane and Misumane which drain into the Olifants River and the Malopene, Ngwenyeni and Nwanedzi into the Letaba River. This undulating landscape occupies 396 km/2 or 2 percent of the KNP. As a result of the higher altitude of this landscape the rainfall increases slightly. 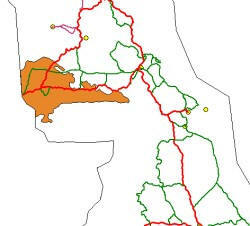 Letaba, to the east of this area has an annual rainfall of 462 mm, while Phalaborwa receives 481 mm per year. High temperatures are registered during the summer and frost is generally non-existent in the winter because of the relatively higher altitude. The soil pattern of the landscape is much the same as that of Landscape 5, 6 and 11. The soils on the uplands are sandy, light yellow to grey in colour and belong mainly to the Clovelly Form. The clay contents of the A-horizon is less than 10 percent. As a result of the lower rainfall the seepline is poorly developed, if at all present. Normally the soils becomes gradually more clayey towards the bottomlands with dominant Forms Glenrosa, Valsrivier and Sterkspruit. Two important characteristics of this landscape are firstly, the occurrence of large numbers of termite mounds on the uplands. These mounds are comprised of light grey soil and are clearly visable on aerial photographs. Secondly, the syenite plugs form prominent koppies which give a unique appearance to the landscape. The soil on the koppies is shallow and can be described as lithosols. The vegetation on the uplands of this landscape is dominated by Terminalia sericea (Fig.19) Depending on the clay content of the soil the following species occur in association with Terminalia sericea, Combretum apiculatum, Colophospermum mopane, Peltophorum africanum, Tephrosia sericea, Dalbergia melanoxylon, Strychnos madagascariensis, Albizia harveyi, Commiphora africana, Grewia bicolor, Lannea stuhlmannii, Cissus cornifolia, Dichrostachys cinerea subsp. Africana, Sclerocarya caffra, Ozoroa engleri and Ziziphus mucronata. Combretum zeyheri and Pseudolachnostylis maprouneifolia are also present on the heavily leached sandy uplands. As the soil becomes more clayey towards the bottomlands (Fig.20), Terminalia sericea disappear together with a few of the above-mentioned species which occur on the sandy soils. Woody species more common in the bottomlands are: Colophospermum mopane, Acacia nigrescens, Combretum hereroense, Acacia tortilis, Bridelia mollis, Cassia abbreviate, Lonchocarpus capassa, Grewia flavescens, Acacia exuvialis, Maerua parvifolia, Euclea divinorum, Securinega virosa, Acacia gerrardii and Ximenia caffra. Dominant species in the field layer of the landscape are Digitaria eriantha var. pentzii, Pogonarthria squarrosa, Andropogon gayanus, Brachiaria nigropedata, Panicum maximum, Eragrostis rigidior, Schmidtia pappophoroides, Aristida congesta subsp. Barbicollis, Heteropogon contortus, Cassia absus, Hemizygia elliotii, Clerodendrum ternatum, Cyphocarpa angustifolia, Evovulus alsinoides, Kohautia virgata, Tephrosia polystachya and Limeum fenestratum. The following species are more typical of the field layer on the uplands: Aristida argentea, A. meridionalis, Perotis patens, Trichoneura grandiglumis. Rhynchelytrum repens, Tricholaena monachne, Ipomoea magnusiana, Crotalaria schinzii, Merremia tridentat, Polygala sphaenoptera Oxygonum alatum, Hemizygia brachteoasa, Tephrosia longipes, Agathisanthemum bojeri, Arthrosolon serricocephalus, Striga bilabiata, Jatropha zeyheri and Aptosimum lineare. Differentiating species of the field layer in the bottomlands are: Enneapogon cenchroides, Urochloa mosambicensis, Cymbopogon plurinodis, Tragus berteronianus, Aristida congesta subsp.barbicollis, Panicum coloratum, Brachiaria xantholeuca. Eragrostis superba, Bothriochloa radicans, Urochloa brachyuran, Themeda triandra, Corchorus asplenifolius, Ceratotheca triloba, Heliotropium steudneri, Cucumis africanus, Solanum panduraeforme, Melhania forbesii, Orthosiphon australis, Crotalaria virgulata, Blepharis integrifolia, Hermannia odorata and Asparagus plumosus. The koppies in the landscape give a unique character to the surroundings (Fig. 21). The plants occurring on the koppies are usually also unique and the following woody species are noted: Kirkia acuminate, Steganotaenia araliacea, Homalium dentatum, Sclerocarya caffra, Combretum apiculatum, Maerua angolensis, Berchemia discolor, Ficus soldanella, Commiphora mollis, Manilkara mochisia, Sterculia rogersii and Croton gratissimus. The riverine vegetation is the same as that described in Landscape 6. The Terminalia sericea sandveld is preferred habitat for sable antelope. They occur fairly generally in this landscape and represent one of the highest concentrations of this species in the KNP. Buffalo occur in large herds, but elephants are usually represented by lone bulls. Kudu, impala and giraffe are well presented, but warthog especially are plentiful in the brackish spots around Phalaborwa. The presence of zebra is determined by whether the veld was burnt the previous year or not.The danger exists of an increased zebra population becoming a threat to the sable. 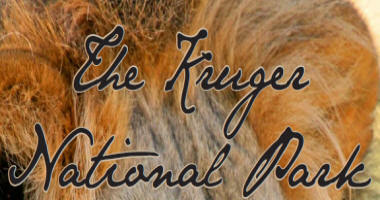 Small game such as steenbok and duiker occur predictably and each koppie has its own one or two pairs of klipspringer. It is interesting to note that the koppies in this landscape form an important habitat for dassies (Procavia capensis). Further south in the KNP this species occurs only on the Lebombo mountains and in an isolated spot at Ntlokweni in Landscape 2. Chloris roxburghiana and Enneapogon cenchroides. The fact remains that these termite mounds make an important contribution to the physiogonomy of the landscape.